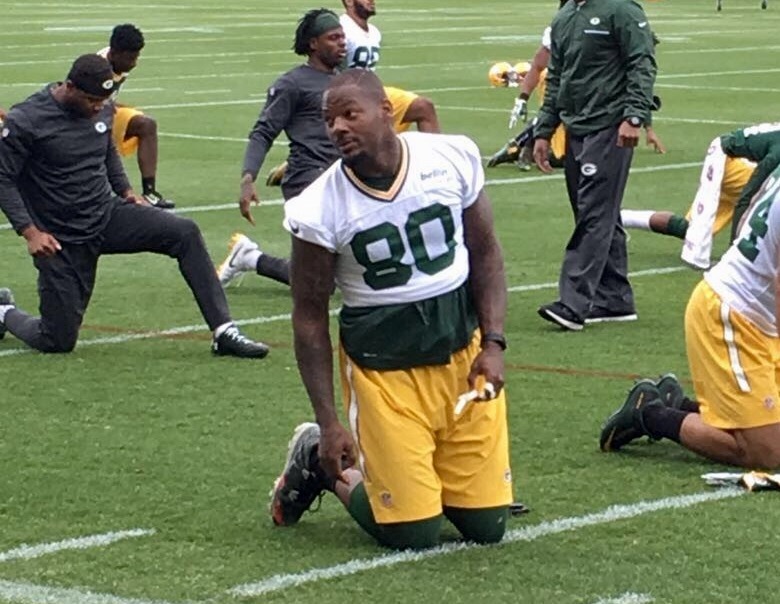 Packers tight end Martellus Bennett (80) met the Green Bay media Tuesday. Martellus Bennett is a fun dude. And he put that big personality on display during his first media availability in the Packers locker room. I’m not sure there’s ever been an official Fun Captain in an NFL locker room, but if there was, Bennett would wear the patch. Earlier this offseason, Bennett was critical of the NFL’s idea of an “instructional video” on how players should (or shouldn’t) celebrate. After all, Bennett believes players should be allowed to express their own individuality, even though he, personally, doesn’t do much chest-pumping. The NFL announced Tuesday that they’d be more lenient on celebrations, allowing players to use the football as a prop, and go to the ground to celebrate. A change that’s likely to result in more “fun” — something Bennett is willing to take credit for. Whether the NFL tips its cap to Bennett or not, he’s a welcome addition to the Packers. He fills the hole left by Jared Cook as the No. 1 tight end, and Rodgers said he expects him to bring a new attitude and confidence to the team. And while he has yet to practice in a Packers uniforms in pads, it’s clear that Bennett has already become a go-to guy in the locker room. Bennett signed a three-year, $21 million deal with the Packers this offseason, including $6.3 million guaranteed. Now entering his 10th season at age 30, the Packers will be Bennett’s fifth NFL team. He won his first Super Bowl ring last year with the New England Patriots, and now he’s hungry for more. For the Packers, a second Super Bowl berth in the Rodgers Era has been elusive. Since winning Super Bowl XLV to cap off the 2010 season, the Packers have had a 15-1 season, and lost in the NFC Championship twice. While the offense hasn’t been the problem, it never hurts to give a two-time MVP quarterback another weapon. In roughly 11 minutes in front of his locker, the Packers’ new No. 80 had the media eating out of the palm of his hand. He’s an entertaining guy with a magnetic personality. And if he wants to be called the Captain of Fun, then he won’t get too much push-back. Marques Eversoll hosts “Air it Out” (9-11 AM) weekday mornings, and co-hosts and produces “SportsLine” (4-6) PM weekday afternoons. He’s on Twitter @MarquesEversoll, and accessible via email at Marques.Eversoll@cumulus.com.